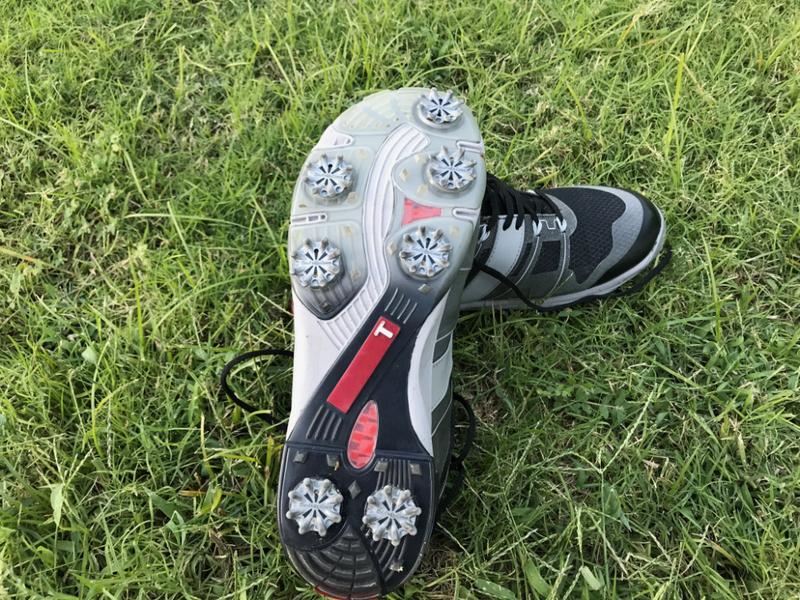 One of the biggest differences between the TRUE Elements Pro and the majority of shoes from TRUE is that they are not spikeless. To be honest, I’d rather spikeless shoes as I like to just throw them on at home, drive to the course, and then be able to leave them on for the rest of the day. 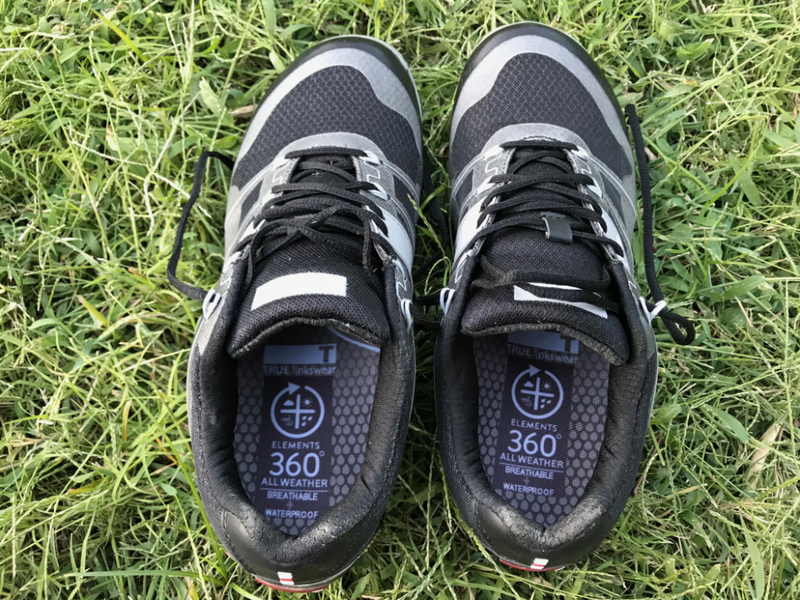 The Sensei shoes, for instance, became my daily go to pair of shoes (not just golf shoes, but every day shoes) because of their versatility, which is something that the Elements Pro will never be. With that being said, the fact that they are not spikeless is only a minor gripe. The simple truth is that these are golf shoes and the question is, are they good ones? The simple answer is yes. Read on for the longer answer. To be honest, one of the things that I have not loved recently about the TRUE Linkswear shoes is their look. While I heard all the jokes about “clown shoes” with the original lineup, I always liked those, but the last few just haven’t looked that great to me. The Elements Pro change that, as to me they look almost like an updated version of the Sensei model that I loved. I received the Black/Silver version (they are also available in Blue/Silver and White/Silver), and I think that they are done very well. The majority of the shoe is a black mesh-like material with silver highlights. I was a little concerned at first that the silver might be too flashy/reflective, but this was not the case. The other thing that’s important to me with golf shoes is that they need to look good with both pants and shorts. In the summer out here temperatures regularly reach 110° or more, and in the winter, early morning rounds can start in the lower 50°s, so versatility is important. Some of the more classic looking shoes don’t do so well with shorts in my opinion, while others seem to look off with pants. While the Elements Pro definitely have a more athletic look to them, I’m comfortable wearing them with pants or shorts. One thing that I’ve always loved about the shoes I’ve owned from TRUE Linkswear is that they have always been comfortable out of the box. To me, this is extremely important as it’s tough to enjoy a round of golf if my feet are killing me. 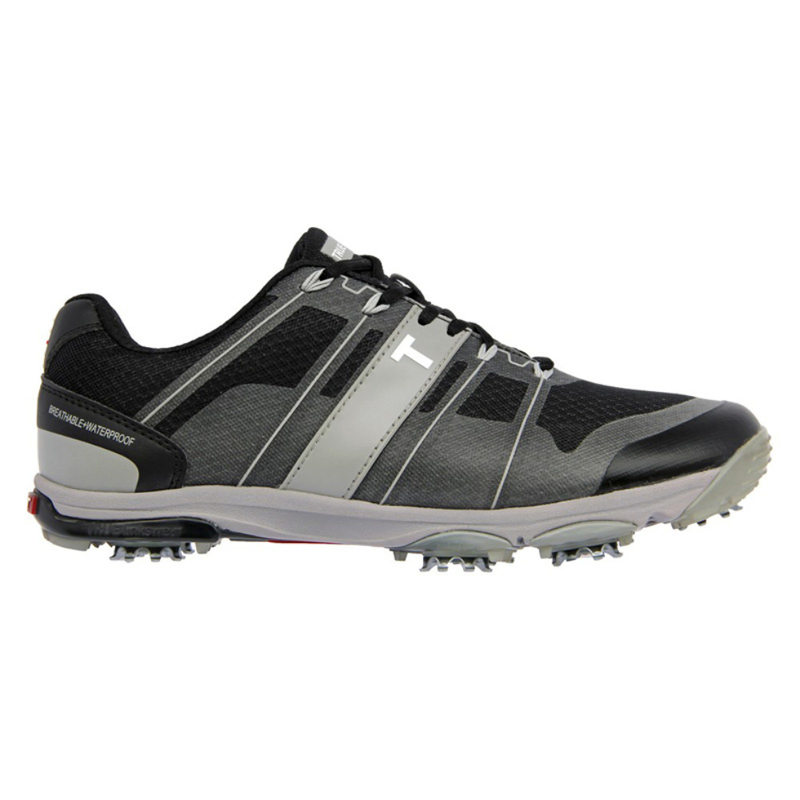 The Elements Pro are no exception to this, as I found them comfortable on day one, which happened to be a 36-hole day. According to TRUE, the Elements Pro have three key elements; the True Comfort Inserts, Outlast Liner, and Sympatex Recyclable Waterproof Liner. The idea with these shoes is no matter the time of day, temperature, or conditions, they’ll do their job, and do it well. My very first day on the course with these, I put them to the test as I played 36 Holes at PGA West with fellow Sand Trap Member @Golfingdad. We teed off fairly early, knowing that we were going to be playing two rounds, and as such the grass was still wet from the early morning waterings. By the second 18 the temperature had risen to about 106°. Throughout all of this, my feet stayed remarkably dry as the shoes kept out any moisture from the ground yet were breathable enough to not let my feet sweat too much. From a traction point of view, these shoes performed very well. Even in wet grass in the early morning, I never felt like I was slipping. Obviously the fact that these shoes have spikes helped in this area, but it is worth noting that I never felt like I was slipping in spikeless TRUE Linkswear shoes. One key difference between these and other TRUEs that I have owned are their flexibility. The Sensei shoes, for example, I could easily fold in half. The Elements Pro, while flexible, do not reach this level. Overall, the one knock that I have on these shoes is the spikes, and like I said earlier, that is only minor. On the whole, I find these shoes to be extremely comfortable, good looking, and high performing. What else could you really ask for? 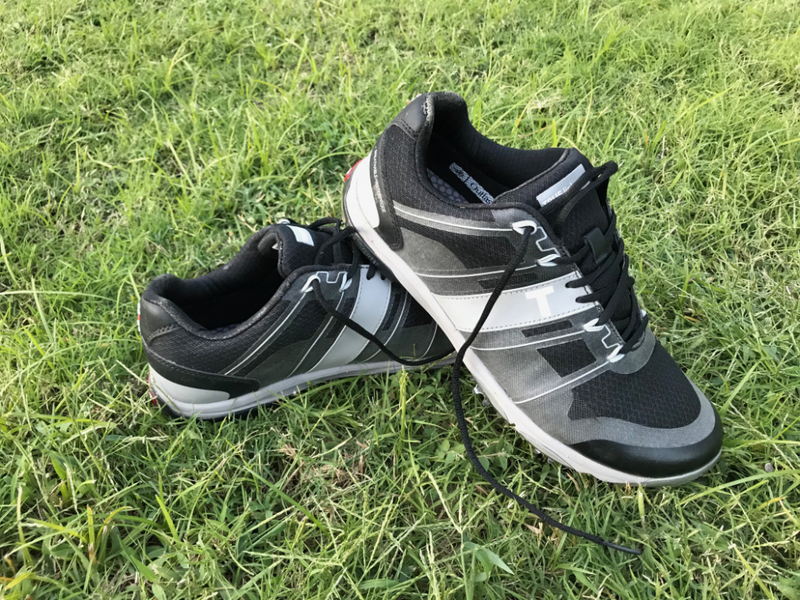 If you were to have asked me a couple of years ago what brand of golf shoe you should buy, the answer would have been easy, and it would have been TRUE Linkswear. The last few releases made me question that and had me looking at other brands for my next golf shoe. It is safe to say that with the Element Pro I am leaning back towards TRUE, and if the two newest versions (the Outsider and Original, reviewed here) are any indication of things to come, then I am 100% back on TRUE’s side. The question at the end of these reviews is always: is this product worth buying? My answer to that would be yes, especially if you want shoes with spikes. For some, the fact that TRUEs never had spikes was a deal breaker, so for those individuals, the Elements Pro allows them to get the comfort they’ve been seeking in a shoe that still has spikes. If you don’t want spikes, or you just really don’t care, then I highly recommend that you try another offering from TRUE Linkswear that will offer you more versatility.